What separates youth radicalization in Greece from other European countries such as Hungary and Bulgaria? 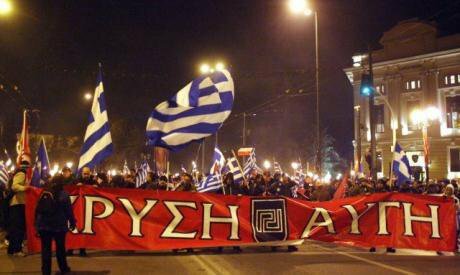 Golden Dawn supporters march in central Athens. Flickr/alba.christiansen. Some rights reserved. The last decade has witnessed the political radicalization of youth throughout central and southeast Europe. This brief analysis is structured along the model of a grass-roots approach and revolves around political culture. Of particular importance is the politicization of youth towards brands of radicalism whose political culture has been traditionally associated with the far right. Quite a lot has been written about Golden Dawn’s technology of mobilization and successful political involvement among the Greek youth. Greece also provides a rather unique and intriguing case where the political culture of ‘new’ political initiatives within the far left bears certain analogies with the political engagement of the ‘new’ far right in other countries. In order to stress the particularities of the Greek case, a preliminary reference to the more ‘standard’ trajectories of youth radicalization in Hungary and Bulgaria might be useful. Jobbik has managed to take advantage of a rather common grievance among the younger generations throughout central and eastern Europe. This is, namely, the allegation that mainstream parties are either built upon nepotism or dominated by the older generation, leaving little space for the political representation of young people. Apart from persistent anti-Communism, Jobbik’s platform has capitalized on a specific particularity of the Hungarian party-system. This is the absence of a political spectrum to the left of the Socialists (MSzP) able to critique the privatization of the economy and the role of multinational corporations. Consequently, Jobbik’s ‘artificial anti-capitalism’, found in the party’s concept of ‘Eco-social National Economics’, appeals to certain segments of young people in crisis-hit Hungary. Ataka’s political engagement among the Bulgarian youth operates along similar lines. Apart from deploring the long-term impact of Communism upon the country’s political landscape, the party’s rhetoric equally comprises elements of ‘artificial anti-capitalism’ and 'hard Euroscepticism'. The country’s political elites are constantly condemned for being subject to ‘the forces of globalization that are out to dominate the world’. Furthermore, in a rather comparable vein to groupings such as Obraz and Dveri in Serbia, the EU is being castigated as a supranational entity with the aim of promoting deviant trends of social behavior (e.g. homosexuality) and uprooting the traditional system of moral values in Bulgaria. Attention is also paid to the alleged discrimination and ‘second class citizen-status’ of Bulgarians in countries such as the UK and the Netherlands. As public surveys have demonstrated, the younger affiliates of Ataka and Jobbik tend to draw on the following premises: (a) the conviction that Bulgaria and/or Hungary have been taken over by supranational entities and global capitalism; (b) the tendency to dissociate the ‘corrupt and treacherous elites’ from the ‘virtuous and, ultimately deceived, masses’; (c) the occasional endorsement of violence as political practice; (d) latent anti-Semitism and the espousal of various conspiracy theories. The trajectories of youth radicalization in Hungary and Bulgaria seem rather ‘standard’. They have been engineered by far right parties in post-Communist countries and they blended traditional anti-Communism with elements of ‘artificial anti-capitalism’ and 'hard Euroscepticism'. In terms of political culture, societies are stratified not only horizontally (i.e. on the basis of political preferences along the left-right spectrum) but also vertically (i.e. on the basis of either more or less conservative systems of social values). With specific regard to twentieth century Greece, Marxism-Leninism as a set of ideas was introduced into a traditional and poorly industrialized society. On certain occasions, this led to localized understandings of Marxism that placed a greater emphasis on the metaphysics of an affinity (or continuity) with the Christian Orthodox worldview than on class struggle as such. It is not a coincidence that, during the 1980s, certain founding fathers of the neo-Orthodox movement had been involved either in the Communist Party-KKE (e.g. Kostis Moskoff) or the Eurocommunists/KKE Esoterikou (e.g. Kostas Zouraris). Meanwhile, KKE in particular, has always been popular among the socially-conservative, proletariat in Athens, Piraeus and Thessaloniki. This idiosyncratic interplay between leftist political preferences and socially-conservative (or, occasionally, ‘reactionary’) norms or beliefs manifests itself in various ideological shades and forms. For instance, one may even come across references to an alleged ‘pact’ between the interwar Zionist International and the Nazis in conversations about Palestine on the Greek leftist web (e.g. the ‘Say No to the Golden Dawn’ page on Facebook, November 2012). Moreover, the long-term impact of the ‘metapolitefsi syndrome’ has left its own imprint on Greek society and its political culture. Metapolitefsi can be roughly defined as the democratization process that commenced after the fall of the military junta in 1974 and lasted throughout the 1980s. Following the delegitimization of the authoritarian right, the conviction that any radical, groundbreaking and ‘anti-systemic’ political proposal is almost bound to originate from the left became widespread. Golden Dawn’s recent popularity among the younger age-groups may come to dispel the persistence of the ‘metapolitefsi syndrome’. Nevertheless, a considerable percentage of young Greeks with a broadly-speaking ‘anti-systemic’ orientation would still be very wary of parking their radicalism under the wings of the far right. The last few years have witnessed the emergence of brand new initiatives within the Greek far left. The most noteworthy of these groupings are Aristeri Paremvasi (‘Leftist Initiative’) and Aristeri Antikapitalistiki Paremvasi (‘Leftist Anti-capitalist Initiative’) - but there are plenty of others. These organizations have been active in several universities and they exert a political appeal to middle-class youths. Moreover, they strongly differentiate themselves from, and oppose, Greece’s more mainstream left. For instance, the Communist Party’s youth organization (KNE) is seen as conformist, monolithic, almost a ‘museum item’. Allusions to the alleged cooperation between KNE and the police have frequently been made. Meanwhile, SYRIZA and its synistoses (‘premises’) are dubbed ‘systemic opportunists’. Nevertheless, Greece’s ‘new’ far left does not view SYRIZA’s rise to power as a necessarily negative development. Within the frame of a ‘Kerensky momentum’, these groupings often view the new SYRIZA-led government as the very first step for the potential radicalization of society in the direction(s) which they desire. Reading the ‘new’ far left’s declarations and browsing the relevant websites one is immediately confronted by a pompous display of verbal radicalism and subversive slogans. However, in contrast to older initiatives among the Greek far left, the ideological content as well as the foundations of this radicalism are very weak. In addition to abstract radicalism, the rhetoric of the ‘new’ far left also comprises the following ingredients: (a) conspiracy theories over domestic as well as global politics; (b) ‘scandalology’ over corruption issues; (c) occasional endorsement of political violence. The coverage of the Palestinian issue in the relevant web-sphere may occasionally hint at an undercurrent of anti-Semitism. Meanwhile, signs of underdog nationalism vis-à-vis the nations of northwest Europe may also be detected in the light of the economic crisis. With specific regard to the endorsement of violence, the most notable occasion has been the verbal and physical assault on Professor Nikos Marantzidis in Thessaloniki (June 2014). A modern historian by specialization, Professor Marantzidis was assaulted by a group of supposedly ‘leftist’ youths, on the basis that his press commentaries were ‘insulting towards the left’. No organization claimed responsibility for the incident. Leftist Intervention, the United Independent Leftist Movement-EAAK and likeminded groupings, however struck an apologetic stance and concentrated on Marantzidis’ allegedly ‘revisionist’ account of the Greek civil war (1946-49) instead. Since 2012, the so-called ‘theory of the two extremes’ has become rather fashionable among political analysts in Greece. In short, the proponents of this theory contend that Greece has been undergoing the threat of a fusion between the forces of the far left and the far right. With specific regard to the far left, one might argue that this was a bulwark that the declining parties of PASOK and New Democracy employed against SYRIZA’s increasing popularity. Nevertheless, since the advent of the economic crisis, SYRIZA has been transforming into what Gramsci might describe as a wide-reaching coalition with the aim of accommodating a broad range of interests. Therefore, the party’s classification under the ‘far left’ category might be inaccurate, to say the least. The current pact between SYRIZA and the Independent Greeks does not indicate a merger between the far left and the far right either. Despite certain controversial statements, Panos Kammenos is not more of an ultra-nationalist or a closet anti-Semite than quite a few of his former colleagues in New Democracy (e.g. Adonis Georgiadis and the rest of the LAOS core who moved to New Democracy in 2012). However, the landscape becomes much fuzzier when it comes to political culture at the grass-roots level. As has become obvious, the political behavior of these ‘new’ far left initiatives bears qualitative analogies with certain courses of action espoused by the younger affiliates of Jobbik or Ataka (abstract radicalism and the endorsement of political violence, in particular). This observation gains higher significance considering the state of flux in Greece’s political landscape as well as the fact that we largely have to do with middle-class, formerly apolitical, youngsters. Most importantly, this represents one more strain of radicalization within the middle class as a result of detrimental and counterproductive austerity-policies. Apart from rethinking austerity-policies, it also remains vital that the mainstream parties of the Greek left do not caress the ears of those, highly confused, initiatives for short-term political gains. After all, as the KKE-veteran Harilaos Florakis once stated: ‘to the left of the left, there is the (far) right’.